In part one of CSP Partner Profitability, we discussed how the cloud opportunity is predicted to grow to $500B by the year 2020 (IDC). And more importantly, for CSP partners to fully take advantage of the cloud opportunity, they MUST bring a differentiated offer to market in order to be profitable and stay competitive. In Part II of the CSP Partner Profitability series, we’re taking it one-step further – into the world of marketing. We’ll cover how to best showcase your differentiated offer to attract and win new customers. First things, first. Here’s what we know about cloud customers based on studies from IDC and Microsoft. 1. The $500B cloud opportunity is being driven by customers. A vast majority of customers want and expect cloud to be part of their business strategy. In fact, IDC’s 2015 customer poll identified that only 8% of customers are not interested in cloud. 2. Customers want innovation and product and services quality. A growing number of customers want to buy from a single provider who will address all of their needs – they want a trusted advisor. 3. The cloud opportunity is being driven by not only the folks in IT, but more and more by Line of Business (LOB) leaders. This should drastically affect how Cloud Partners go to market to attract, delight and win new customers. 4. 65% of a customer’s buying decision is already made before they even contact a sales representative. Customers use a wide-array of online content from websites and review forums to trade publications and social media when researching solutions that will best meet their needs. So, what does this mean for you, a Cloud Partner? Well, it means customers are actively researching your solutions and making mid-stage buying decisions based on the information that they find. Therefore, in addition to competitive differentiation, you need to find and actively engage in the online communities where your customers live and produce the relevant and value-added content that will drive them to purchase your solution over a competitor. Does your website scream your value proposition? Is it engaging and easy to understand? Does your messaging make it easy for potential customers to derive what makes you better than your competitors? Does your website showcase your business as being a voice of authority that can be trusted? In a world where ‘Content is King’, do you offer compelling content that engages potential customers and pulls them in to consume more and more? Does your content overtly address how your business helps to solve customers’ needs? Do you offer a wide range of up-to-date content like blogs, videos, white papers, customer case studies, demos, etc., that not only showcase your solutions, but also answer any questions your customers may have? Are you present and actively listening and participating in online communities where your customers and prospects are sharing information and consuming content? Are you interacting with customers through their preferred social and online communities? And what are you doing to foster the same social listening and social selling behaviors with your internal teams in sales, marketing, tech, etc.? Are you investing in digital marketing to track new leads and give potential customers a reason to provide their information? How are you aligning with the customer journey? What’s your hand off strategy to your sales teams and how are you converting your warm prospects into buying customers? These are all important questions for any Cloud Partner wanting to build a strong market presence. The great thing is, you don’t have to go at this all alone. As a Microsoft partner, you have access to a plethora of Marketing assets including great guidance via the Microsoft Smart Partner Marketing website. And as a partner of Exinda, you have access to great Marketing assets and Marketing support too! Thinking about becoming an Exinda Partner? Want to showcase your thought leadership and create credibility within the industry? We can help! Submit original content to be featured on the Exinda Blog as a guest post. In return, you’ll also receive an original post from the Exinda team to post on your blog, forum or whichever platform you choose. Co-host a customer facing webinar with the Exinda team to kick off your reseller partnership. It’s a great way to get increase brand awareness, generate new interest and bring in leads. Need some deep technical docs and demos to enable your sales team? Exinda partners get access to our wide-array of marketing and sales collateral that can be co-branded using our Marketing Collateral Generator for Partners. You can also use our unique and award winning product software at no charge. You can either create a demo based on your own environment or use our demo site to showcase our products as well as your business and technical prowess to dazzle your customers. 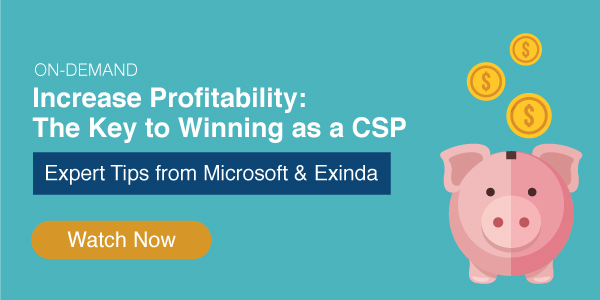 Want a little more info on how Exinda can help increase CSP partner profitability? Contact our Microsoft partner expert Gayle Riviere or download our on-demand webinar.